The International Standard for Phytosanitary Measures number 15 (ISPM-15) is the regulation of wood packaging material (WPM) in international trade. ISPM-15 assists in the prevention of the worldwide spread of plant pests & disease and requires that WPM be treated to a core temperature of 133F for at least 30 minutes. Our heat treatment services meet ISPM-15 standards & are available for materials purchased directly from us as well as your own pre-assembled products for export.Your wood products will be clearly marked with our "HT" stamp so you are confident that your international shipment will not be rejected by border inspectors due to non-compliance. Unsure about your current pallet or wood crate design? Need something to meet new shipping requirements? 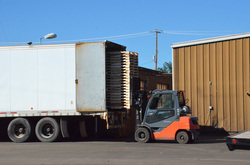 The Pallet Design System (PDS) was developed by the National Wooden Pallet & Container Association. This state-of-the-art system lets us to find the perfect balance between functionality and economy to meet your needs. Pallets and boxes are key components to successful unit load material handling; they are the interface between the equipment, the impacts of handling, and your valuable unitized product. We will provide you with a weight and durability analysis so you can be sure it works before your product heads out the door. PDS allows us to assist you in Reducing Costs, Reducing Product Damage, and Increasing Safety during the unit load handling system. Reduce lead time and manage your inventory space efficiently when using stock from our large volume production runs. ﻿C&K Box offers a variety of vendor managed inventory programs including weekly releases, blanket purchase orders, pre-paid stock, and more. Call us today 517/784-1779 and see how we can help you manufacture and ship effectively. Full Semi Loads to Small Volume Delivery. Servicing Southern Lower Michigan, Northern Ohio and Northern Indiana. We meet our customers' demanding shipment schedules in the most economic & efficient method possible. Prefer to pick up? We'll load your truck in our yard. We work with you to ensure that your time frame and cost concerns are met.